"I am Elessar, the Elfstone, and Envinyatar, the Renewer": and he lifted from his breast the green stone that lay there. "But Strider shall be the name of my house, if that be ever. 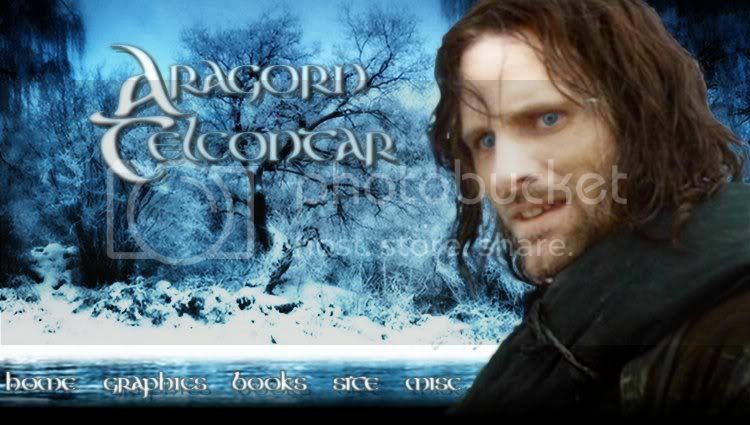 In the high tounge it will not sound so ill, and Telcontar I will be and all the heirs of my body"
-- Aragorn, "The Return of the King"
Welcome to Aragorn Telcontar! I am currently in the process of adding more and more to my site. It is a host for some graphics for your use, some of my writings, a few tutorials, and a guide for every webmaster or webmistress. The aim of this site is not to get money, or any other vain objective. I am a teen who wants to honor God and serve Him! Creating a website is one of my interests, along with graphic design and writing. All I do on this site is for Christ’s glory. You will find nothing on this site that is immoral or unGodly. I will try to update this site regularly, so, chances are, if you return you will find more than when you were here last. But, because of everyday employments, I cannot promise you this. Enough of my prattle. Without further delay, I bid you all welcome to my humble domain! Enjoy and God bless! I have a new affiliate! The Elfstone is a pretty amazing LOTR website! Check it out! Also, The Elfstone is a new nominee for the Aragorn Telcontar Awards. I have made a new layout for the Awards section. You can find it in the Site area of the site. Do not worry, nominees, I havent changed anything essential to this round. You are still nominees and will be given awards probably around Christmastime. Sorry everyone for lack of updates. :S The winter theme is up and running. I will try to be a little more active over the holidays! It has been a while since I posted in here. School has gobbled up a bit of my time, but I just got a chance to put up some amazing Pride and Prejudice banners in the banners section. Check them out! They are the best banners I have created so far. I really should have posted this yesterday, but I have a new nominee for the awards! ESDLA Espanol! I have two new affiliates: Palespring and Sorrow of the Firstborn! I finally created an awards section to my site! [located under Site] Go nominate your site! I also created a contest and Elvish section! [both located under Misc]. I should have posted this a little bit ago, but I have three new affiliates: Merry Brandybuck, Women of Valor, and ESDLA. I have added the Tolkien Biography located in the Books section! I have THREE new affiliates! Land Beyond the Sea, Clarett, and Ramandu's Island are the three great websites that became my affiliates! I have a new affiliate, LOTR, The Legend Comes to Life, an amazing LOTR site with way better graphics than what I have. There are some avatars and other graphics in the Fan section, created by the amazing Flinn and Theldir! I added a new section about the Lord of the Rings. It goes by the title BOOKS. There is also a part on J. R. R. Tolkien in that section! The Autumn Layout is here!! I know it is really early, but I was very excited about it. The site has changed a little bit for the better [hopefully] too! This site has had a few updates including it's first piece of fanfiction, "Of Chilly Dwarves and an Angry Elf" written by the amazing Flinn! Alot of changes have been made to this site, and I mean ALOT. What used to be known as "Wood Between the Worlds" is now Aragorn Telcontar. In short, I thought it would be easier for me and my visitors to have a theme to my site, other than the more general theme of graphics. As you can see, there are a few more changes to be made, but there also will hopefully more to this site tham just graphics, though graphics will still be what this site will be centered around. Tell me what you think of the new layout and theme in the Guestbook. Today I received my first affiliate -- Teen Perspectives, a Christian blog run by teens who want to honor God! The construction is complete! There will be more pages and more content added though, and hopefully more traffic. I haven't updated much yet, but there are and will be more new LOTR banners!! The new layout is complete! I named it "Midnight Forest". Comment on it in the Guestbook. I am also working on FAQs and affiliation. As you may already know, my site is under construction. The main reason for this is to produce better site graphics. I am still hoping for a new site banner, possible affiliates, and more traffic. Also, I am working on putting more content up.